eat run sail: How to Overcome Emotional Eating... What are You Really Hungry For? 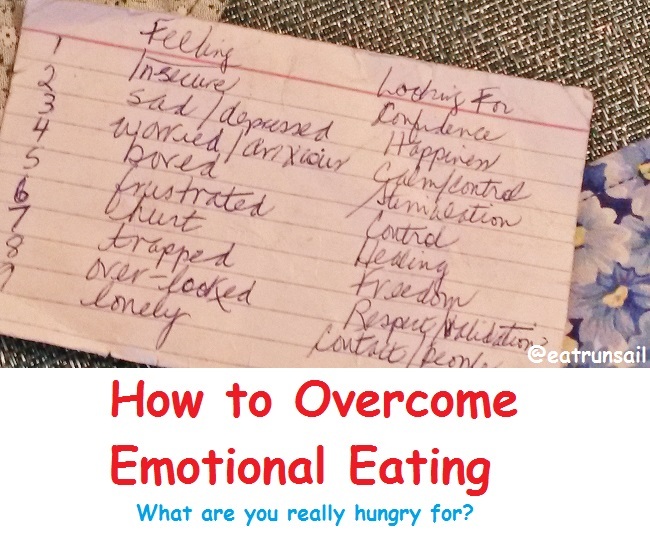 How to Overcome Emotional Eating... What are You Really Hungry For? Emotional eating... such a hot topic and such a real problem for so many of us... me included! It is something I have struggled with all of my life and I know I am not alone. I thought I would share some of my thoughts and insights. Well, in fact, it may not be. If you are one of those lucky people who can grab the odd hotdog at a ball game just because it's what you and your friends do... or someone who can enjoy popcorn while sitting in the movies... and you aren't overweight, that's great. Perhaps it isn't a problem for you. But for many of us who 'comfort eat', it is a problem... a very big one in fact. As a long time Weight Watcher, I have heard this phrase repeated in every meeting room I have ever visiting in various parts of Canada and the U.S.A... 'If hunger is not the problem, then food is not the answer'. YUP, it's true. Food is fuel for our bodies. It sustains life. We know this to be true. How do you know if you are eating emotionally? Are you eating when you aren't physically hungry? Are you leaning on an open fridge door looking for something that appeals to you, or are you willing to eating anything you can find because you really are famished? Perhaps you just had dinner and now you are wanting to munch while you watch tv in the evening.... these are some of the signs. Why do we eat to soothe our emotions? This is something that I have been thinking a lot about lately. And for me, when my emtions are highly engaged, I often actually feel a fluttering or a churning in my stomach. Food soothes that feeling. And food is also a convenient and easy distraction to take our minds off the feeling... to quickly alter the mood, even if only for a few minutes. Food is brings up favorite memories. We may associal chocolate chip cookies with pleasant events from our childhood. And there is also a biological component at play as well... I have learned that the hormone corisol is released into our bodies when we feel stress and that hormone makes us actually crave sugar, carbs and fatty foods. So these types of foods really soothe the chemical changes that cortisol makes in our bodies. How do we overcome emotional eating? Well, obviously, the first thing we have to do, as with any problem we want to solve, is to recognize what we are doing. I know that in my Weight Watchers meetings we talk about things we can do to distract ourselves from raiding the fridge such as sipping herbal tea, or going for a walk, or calling a friend or soaking in a nice hot bath... and if those things work for you, that's great. I am happy for you. They don't work for me. The problem with distracting myself is that the emotion itself is never taken care of. It is going to come up over and over again until I deal with it. Distraction is nice for the moment, but at some point, I have to face what is really bothering me. Recently, I found this recipe card when I was changing handbags. It is something I have been carrying around with me since writing it at a Weight Watchers meeting many many years ago. The meeting was about the topic of emotional eating, and the very insightful leader that facilitated the meeting had us all write a list of emotions that we wrestle with on the left side of the card, and the solution to 'feeding' them on the right side of the card... these are what we consider negative emotions... the ones that tend to make us run to the cupboard to look for a box of cookies. Now, I am happy to be able to say, that since I left the corporate rat-race, that I don't feel a lot of these emotions anymore. But there are still a couple on this list that I do face from time to time. And perhaps there are some that you face, so I will share my list with you. I suggest you sit down and write your own list if you think that this is an exercise that would help you. And what if I am not feeling negative? Not all emotional eating is triggered by negativity. Sometimes we are excited, or even elated and feeling quite celebratory. These positive emotions can make us want to eat as well, so don't get fooled into thinking that what you are dealing with isn't emotional eating, just because it comes from feeling good. Perhaps you grew up in a wonderful family like mine... my Mother was always there to wipe away the tears from skinned knees and offer a cookie along with a kiss to make me feel better. My Father rewarded us with ice cream cones after behaving in church on Sunday mornings. Every family get together involved massive amounts of great food. Scared of the thunder storm?.... hot cocoa with marshmallows... No wonder I turn to food to soothe my feelings. But you can change it. And I work every day, very consciously to do this. Overcoming emotional eating has become a process for me. For example... If I start to get a yen for a little something to eat, and I realize it has only been an hour since I had lunch, I KNOW that I am not really hungry.... so I might have a drink of water to distract myself and think about what is really bothering me and making me want to eat. Generally, I try to recognize the feeling and then figure out what I really need... sometimes I need to ride out the wave of the emotion... other times I realize I can easily solve the issue fairly quickly... or else make plans and take action to do that. Other times I have to recognize that the issue may be something out of my control and make an attitude adjustment to rid myself of the negative feelings. And, being the flawed human being that I am... yes, sometimes I give in and eat. But I am doing it less and less. It takes work, and mindful thought, but I am having more success. What about you? Are you an emotional eater? How do you deal with it? I've definitely struggled with emotional eating in the past. I find that taking a pause and asking myself if I truly AM hungry, will help me to reset. I am a total emotional eater, and it's actually started getting a bit out of hand lately. Thank you for this post and for the tips to help me make a change! As a young adult I had a lot of food issues but at last I feel like I finally am free of them. It's a tough issue to tackle! I'm an impulsive eater. If I am emotional, I can eat or not eat, but I go to extremes with whichever option I go with. Once I start, I cannot stop. I try not to let myself get into those situations. Thank you for sharing this, I am sure it will help many! As with so many things, recognizing the problem is the first step towards solving it. Great detailed post about what to look for. I'm not an emotional eater, in fact, I'm just the opposite. But I know I'm in the minority. I can see how it happens, tho. In my clinic, I see parents offering their crying babies the bottle or snacks all the time. It starts early. I'm an impulsive eater more than emotional. It's a weird habit to try and break. I don't think I'm an emotional eater, for the most part, but I guess sometimes, when I get stressed, I can really swing to either extreme. I did have a severely unhealthy relationship with food growing up, but I think I'm doing a lot better. Its so easy to turn to food when we're emotional, especially stressed. But there are so many better ways to handle and manage our emotions. Just today I struggled with this. My worst food-related habit is mindless, boredom eating. Today I didn't even know what I wanted as I stood there looking in the pantry. What I needed was a break from a writing assignment that wasn't flowing. I settled for Greek yogurt and a bike ride. I never understood why parents proffered sweet treats for booboos :-) UNTIL I HAD A CHILD!! my own parents didnt do it but for some odd reason I *did* feel the pull to offer a popsicle when she skinned her knee when she was tiny etc! I really think had I not read and read and read before we adopted her Id have done just that and set her up for that pattern for life. I'm totally an emotional eater. This has been a rough week and I've struggled all week to only eat when I'm actually hungry. I haven't been totally successful, but knowing that my "hunger" is emotions has allowed me to keep it somewhat in check. I'm more of an emotional drinker...is that worse? lol...seriously I have had lots of emotional eating moments too and it's def not the best way of dealing with my issues. Great post.